The dog days of summer are nothing in comparison to the brave Dogs of Winter: The Labradors and Chessies with ice forming on their coat and a wild eyed gleam of mallard reflected in their eyes. The gallant dedication of the waterfowl dog is rarely outmatched by their fanatical trainers. I have had the opportunity to hunt with some good bird dogs and experience some amazing successes. Like all dog men I have also had my share of lost hunting companions and new puppies alike, the highs and the lows of life with retrievers. Two years ago I got to witness an amazing retrieve and a lightbulb moment for another hunter. Nate and I were hunting a tidal slough near Coos Bay, Oregon when Nate decided to take my dog Deco and head for the other end of the field to jump shoot some birds we had seen land. Nate hasn’t trained with Deco and has always had some misgivings about the usefulness of bird dogs. I watched from the blind as the pair started to cross the flooded field, and saw the dog caught a scent and ran off. Nate was hollering and obviously not happy with the situation. The dog disappeared into the woods for several minutes while Nate unhappily trudged on out across the field. The wind was blowing pretty good and Nate’s back was to the woods when the dog emerged triumphantly with a live duck. The dog then proceeded straight out to heel at Nate’s side with the duck in his mouth. From 300 yards, I could see the light turn on when Nate saw the dog. Nate confirmed later that he had been mumbling negative dog mantras when Deco appeared. The cause of the light switch was a fat live mallard that only Nate had shot at. The bird had flown away apparently unscathed. When Deco cut the scent he knew his job and also that Nate’s bird smelling abilities were far below his own dog sense. He took matters into his own paws. 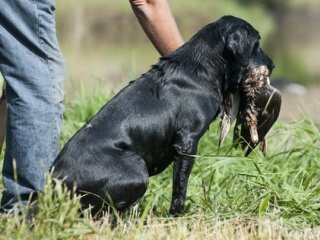 I love to watch good dog handling as much as the next lab man, but every once in a while in actual hunting situations when the dog gets birdy and takes off with decisiveness, I feel that the partnership is complete. At the local mud marsh, my previous lab Java once chased a drake mallard that still had use of his wings. The duck would get up and fly every time the dog started to close. By the time they got out of sight, Dad asked, “That bird is going to get away, right?” I wasn’t so sure because I had noticed that each flight got shorter. Twenty minutes later I started to get concerned for the dog. As I started to leave the blind, faithful Java trotted back into view, the still alive mallard in her mouth. This is what she lived for. Now Deco is faithfully curled next to my chair, and his every sense tells him, it’s bird season. He bolts to attention every time we approach the door, ready to swim the icy waters and shiver in the mud. He’s ready to go all day and then look with longing eyes waiting until the boat gets hitched up again and he can again join in the hunt. Like your dog, like all the dogs of winter.